FORT PECK RESERVOIR, Mont. -- Fort Peck Reservoir in northeast Montana is a long way from everywhere. There are no big cities or major airports nearby, and it takes a full day to drive there from almost everywhere people live. As a result, most ice fishermen never even consider it. That’s a mistake. Fort Peck is the best multi-species lake in the United States for trophy-sized walleye, sauger, northern pike and lake trout. There are other places in America that are as good or better for individual freshwater species, but none can produce so many different trophies from the same ice hole. Lakes Erie and Huron are great for walleyes, several Alaskan lakes are tops for lake trout, and a few private northern Minnesota lakes predictably produce really big northern pike, but all of them are one-trick-ponies. A good spot on Peck will produce trophies in all of those categories on the same day without ever moving. On Peck, walleyes in excess of 12 pounds are common, with 13- to 16-pound monsters possible every day. Northern pike often top the 20-pound mark, and plentiful lake trout routinely best 25 pounds. World-record class saugers are routinely taken from her depths as well. Lots of big fish doesn’t mean Peck is easy to fish, however. A great multi-species spot can be a challenge to find in Peck’s voluminous 247,000-acres of water in the summer, but top the 134-mile long lake with a sheet of ice, and it’s even more difficult. Ice fishermen need to be mobile and able to test the lake’s numerous bays and complicated points. Most use an ATV and a good depth sonar to pick their spots. The good news is that wherever ice fishermen go, they are sure to have the whole place to themselves. A couple places in the United States offer consistent opportunities to catch a 13-pound walleye through the ice, but only Peck gives anglers a chance to do it with no one else around to compete with. That lack of pressure occurs all year, but is more pronounced in the winter, when few anglers tempt Peck’s often-fickle ice. The Missouri River meanders through the lake, making ice weak in spots all along the river’s course, but there are other dangers as well. Pressure cracks are dangerous to cross and easy to see, but there are also gas vents to worry about on Peck. 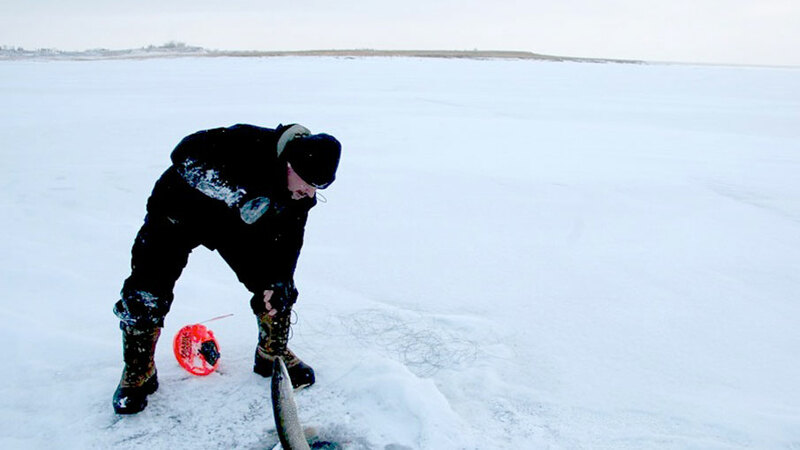 Natural gas vents are scattered all over the lake, and only allow a thin layer of ice to form when the rest of the lake has two feet of solid ice. Many of them are covered by snow and are often big enough to swallow an ATV. First-time ice fishermen on Peck need to constantly test the ice as they move ahead and should stay on established ATV trails. On my first trip to Fort Peck, I talked extensively to locals before heading out onto the ice near the spillway. I picked my way across the ice using handheld sonar to test the depth, and eventually chose a spot near an island that had a deep trough adjacent to a shallow flat. Though a good topographic map would have saved me some time, I was unable to locate one at any local shops and didn’t have an applicable program on my tablet to reference. A local fisherman told me the lake changes so often, maps would often be outdated the same week they were printed. To support his assertion, he pointed out the lake was 50-feet below normal pool when we arrived. As a result, there were islands where none usually existed, and shallow flats that were once deep plateaus. Anglers are allowed six lines each in Montana, and with so much water to cover; my partners and I took full advantage. We set five tip-ups each, leaving us with one line to jig. 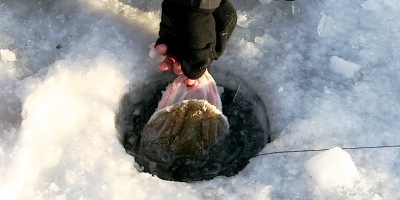 We eventually found jigging to be unproductive, and placed a sixth tip-up on the ice. All of our tip-ups were baited with the biggest decoy suckers we could find. The flags didn’t fly all day, every day, but when they popped, it was often because a big fish had taken the bait. In fact, other than a couple small saugers and walleyes, nearly 80 percent of all the fish we caught were over 6 pounds. In just three days of fishing a lake none of us had ever stepped foot on, we landed a 17-pound northern, a 14-pound lake trout and a 9-pound walleye. What was even more amazing was that all three of those fish came from the same hole. That hole was on top of the shallow flat in only seven feet of water. It didn’t surprise us that big northern were feeding under the ice in shallow water, but the lakers tested conventional wisdom on where winter lake trout live and feed. They are generally considered deep-water fish, though I have caught them in shallow water in the spring on a couple occasions. This first lake trout was no wandering fluke, either. By the end of our three-day trip, we caught more lake trout than anything, and all of them came on tip-ups in very shallow water. Despite 50 years of ice fishing across North America, I caught my biggest iced-over lake trout and northern pike on that inaugural Fort Peck trip. Though it’s tough to get to Fort Peck, it should be on any serious ice fisherman’s short list of places to visit. It could easily be the home of the next world record walleye or sauger, and gets my vote for the best ice fishing lake in America.